We’d love your help. 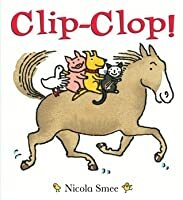 Let us know what’s wrong with this preview of Clip-Clop by Nicola Smee. 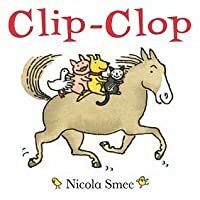 To ask other readers questions about Clip-Clop, please sign up. discuss name the character ? A gaggle of different animals ride a horse together with no respect for species boundaries or traditional behaviours. Really, gay marriage and a female Doctor were always going to lead to this sort of thing - this is the future that liberals want, &c.
Very, very cute. I think it could work for both toddler and preschool. It's right on the line there. The illustrations are simple yet explanatory. (I think the animals are cute, too.) And the story is not complicated, but still keeps you in the flow and wondering what will happen. Some great possibilities with sounds and actions, too. 5/11/10 & 5/13/10 A perfect toddler book. We made animal noises with each new animal. And then we "rode" our horses as Mr. Horse got faster. I think I had a bit Very, very cute. I think it could work for both toddler and preschool. It's right on the line there. The illustrations are simple yet explanatory. (I think the animals are cute, too.) And the story is not complicated, but still keeps you in the flow and wondering what will happen. Some great possibilities with sounds and actions, too. 5/11/10 & 5/13/10 A perfect toddler book. We made animal noises with each new animal. And then we "rode" our horses as Mr. Horse got faster. I think I had a bit too much fun reading this aloud! :-) It's a great book when the parents get involved with the children. 3/17/11 I don't think I read this as well in the first group. They liked it, but they didn't seem as excited at the end as I've seen them. But the 2nd group, not only did I do better at reading, but those kids got so involved! Some were galloping around the room and completely missed the animals flying off. But those still sitting got it. And I think they all enjoyed it. 9/14/16 & 9/15/16 Used in kitty theme (because there is a cat!). Had the kids clap hands on laps to get the clippity cloppity sound. That seemed to work well. Especially the faster, faster. Went very well. 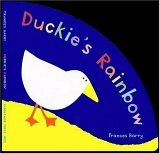 Here's a cute story for really little ones. The reading level falls somewhere between Brown Bear, Brown Bear, What Do You See? and Elephant and Piggie. It doesn't quite have the charm of either, but it's still a good fun with farm animals. Protip: If you don't bounce a child on your knee for the "Clippity clop" parts, then you're doing it wrong. Really cute story with fun illustrations! The kids in storytime loved it. I love using this for baby storytime because it allows for tons of bouncing, interactive fun! First Cat, then Dog, then Pig and finally Duck petition Mr. Horse for a ride. Faster and faster the friends all go before they fall off into a soft pile of hay (a perfect time for tossing a child on a bed at home!). Mr. Horse worriedly checks on the friends only to hear a mighty chorus of "Again!" Very simple illustrations with tons of white space make this suitable for the very young (18 months easily, I love using this for baby storytime because it allows for tons of bouncing, interactive fun! First Cat, then Dog, then Pig and finally Duck petition Mr. Horse for a ride. Faster and faster the friends all go before they fall off into a soft pile of hay (a perfect time for tossing a child on a bed at home!). Mr. Horse worriedly checks on the friends only to hear a mighty chorus of "Again!" Very simple illustrations with tons of white space make this suitable for the very young (18 months easily, probably even younger), but also for beginning readers. The animals have thick black outlines filled with gentle washes of watercolor and are drawn in a style not that far from how children would attempt them (my horses at least always looked similar to Smee's, if not as well-proportioned). 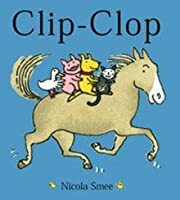 The text will also appeal to toddlers with the inclusion of lots of repetition and some fun onomatopoeia in the "clippity-clop" refrain that runs throughout. Due to the punctuation (dialogue can be confusing for pre-emergent readers), I'd recommend this for emergent beginning readers and maybe some of those who have just made it to early fluency, but the copious white space and large text size provide plenty of rest for eyes just learning to locate text. This is really an excellent choice all around. Love it. Used for Down on the Farm baby storytime August 2008. I've said it in another review, but I have definitely been rating picture books much higher than I would have done before I was actually working with children. There are a also a lot of things that I appreciate now that I wouldn't have noticed before. In the case of Clip-Clop, I appreciate the: repetition, large text, and simple art. I've already read Jingle-Jingle, which is the Christmas/winter version of Clip-Clop, essentially, and it's pretty similar. "Cat and Dog and Pig and Duck" (which the I've said it in another review, but I have definitely been rating picture books much higher than I would have done before I was actually working with children. There are a also a lot of things that I appreciate now that I wouldn't have noticed before. In the case of Clip-Clop, I appreciate the: repetition, large text, and simple art. I've already read Jingle-Jingle, which is the Christmas/winter version of Clip-Clop, essentially, and it's pretty similar. "Cat and Dog and Pig and Duck" (which the children started to chant towards the end) are riding Horse until he goes faster and faster and has to stop, throwing off the other animals. Surprisingly, they enjoy it, shouting, "Again! Again!" What I particularly liked about this was that we did a fingerplay/action rhyme, "10 Little Horses," which at the end includes the line "Then Whoa! (do a 'pulling the reins' motion) They all slowed down (put your hands in your lap)." So that was a very nice tie-in. Mr. Horse asks "Who wants a ride?" and he gets an enthusiastic response from Cat, Dog, Pig, and Duck. Soft, large illustrations and a gentle repetitive text makes this a perfect picture book for a preschool story time. Pair this with Mr. Gumpy's Outing by John Burningham. The typography is atrocious. 22mo loves the part where they all fall plip plop into a haystack. Sigh. It's short, anyway. A friendly horse and some friends go on a trot around the countryside. This book is great for little ones as they learn the give and take necessary for establishing positive social interactions with their peers. 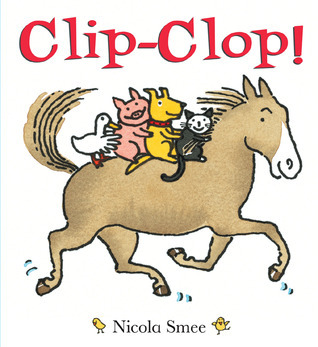 Find Clip Clop at the Westminster Public Library! The girls and I heard this story during baby story time at the library today and we all enjoyed it. F enjoyed being bounced on my lap as we said "Clip-clop". L likes any story that focuses on animals, and this one had bright, bold illustrations. She got a big kick out of the ending; there was a big smile on her face when all of the animals went flying. Very short and delightful adventure story. Great for very young children. 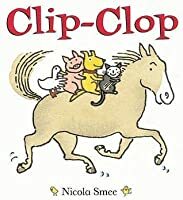 Gives the reader the opportunity to use several different voices and encourage children to participate in the "Clippity-clop" refrains. I think this book would be better for a baby who is starting to understand language more. There are no sounds, and the concept, while simple, needs to be understood to be truly enjoyed. We'll pick it up again in 2019! Gave each kid 2 blocks to make clip clop noises. Big hit. The kids and the parents thought this was so funny. Cute story where animals have a scary ride, but want to go again. Also important: saying please and thank you is incorporated into the story. This book was great. The animals ride the horse, go flying off the horse and then ask to go again. The animal were acting much like children would have. It is a silly little children's book, but most children will recognize both going to fast, falling down, and somehow wanting to do it again. Board book version of the very fun picture book by Nicola Smee! Illustrations contrast well on the white background making it easy to see what's going on. Opportunity to use different voices for the different characters. Lots of great action words.